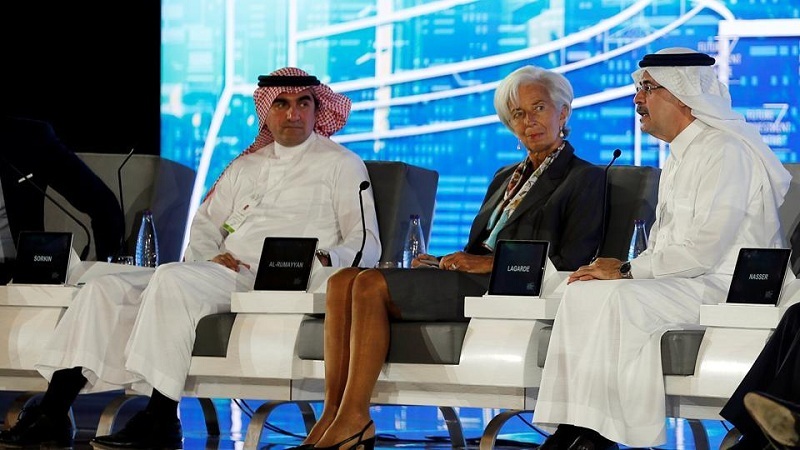 International Monetary Fund (IMF) managing director Christine Lagarde (C) with chief executive and managing director of Saudi Arabia’s public investment fund Yasir al-Rumayyan (L) and president and CEO of Aramco Amin Nasser attends the Future Investment Initiative conference in Riyadh, Saudi Arabia, on Tuesday. The world faces a “dark future” if it fails to tackle climate change and inequality, International Monetary Fund (IMF) managing director Christine Lagarde warned on Tuesday. “If we don’t address these issues... we will be moving to a dark future” in 50 years, she told a major economic conference in the Saudi capital. On climate change, Lagarde said “we will be toasted, roasted and grilled” if the world fails to take “critical decisions” on the issue. In 2015, around 195 nations signed the Paris climate agreement which set measures to reduce greenhouse gas emissions to prevent temperatures rising by more than two degrees in around 50 years. But US President Donald Trump announced in June the start of a three-year process to pull out of the pact, arguing that it would put the US at an economic disadvantage. His move faced fierce criticism from world leaders and activists, with former UN secretary general Ban Ki-moon accusing Trump of “standing on the wrong side of history”. Lagarde also called for tackling inequality between men and women and countries that are “haves” and those that are “have nots”. If the world wants a future that “looks like utopia and not dystopia”, it needs to address such concerns, Lagarde said. She predicted that in 50 years’ time, oil will be a secondary commodity. The world faces a “dark future” if it fails to tackle climate change and inequality, International Monetary Fund (IMF) managing director Christine Lagarde warned on Tuesday. “If we don’t address these issues... we will be moving to a dark future” in 50 years, she told a major economic conference in the Saudi capital.